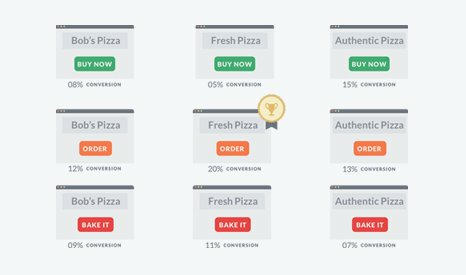 When Should You Opt For Multivariate Testing? Time and again, such statements may have stopped you from performing a multivariate test on your website. But how much of these statements is actually true? Let’s begin with understanding the basics. Difference Between A/B Testing and Multivariate Testing? While A/B testing allows you to compare two or more versions of a webpage by splitting traffic equally among them, Multivariate testing (MVT) allows changes on more than one element on a page and helps you find the best converting combination. Say we have three variations each for the two elements, headline and type of call to action (CTA). 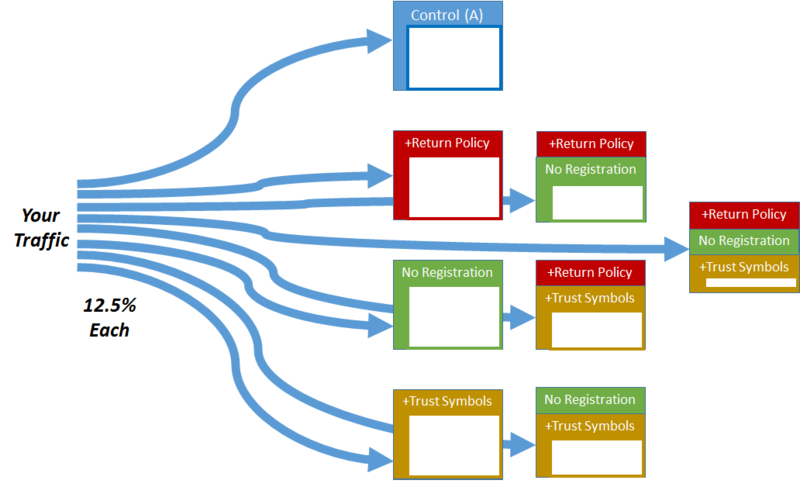 There would be nine combinations of tests (as shown in the image) that need to be run. The total number of combinations can be calculated by the number of variations to the power of number of elements (three to the power of two, in case of the given example) that you want to test. As Brian mentions, multivariate tests are about measuring the interaction effect among independent elements to see which combination works best. The interaction effect measures simultaneous influence of two or more variables on conversions. A/B Test or Multivariate Test—Should One be Chosen Over Another? A/B testing and multivariate testing serve different and specific functions. A/B tests will help you answer questions such as: “Which part of the page should I add a video item to gather maximum engagement?” multivariate tests answer questions such as “Do visitors respond better to a video item next to a contact form?” or “…to a webpage with just a contact form and no video item?” and so on. Simply put, A/B tests measure individual impact, while multivariate tests measure collective impact. Using both as complementary tests can help you gain maximum out of your optimization program. Next, let’s look at what are the prerequisites for creating a successful multivariate test. You should remove the totally improbable/bizarre combination at the planning stage itself. For example, while running an MVT on your eCommerce website, one of the variants may have a headline offering a “$15 off on watches” and a CTA claiming say “Free subscription” to your newsletter, instead of something like “buy now.” These two messages are incompatible. Detect and remove incompatibilities at the preview stage itself. 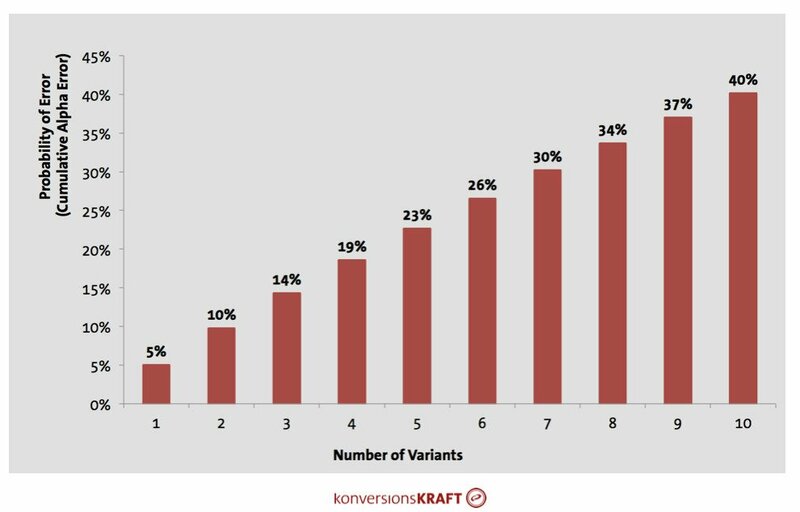 As multivariate tests work on combinations, these create a larger number of variants compared to A/B tests. This means that your overall traffic would have to be divided among all the many variants. For instance, if you have 1,000 visitors landing on your website and you decide to run a multivariate test with three elements and two variations, each variation would get 125 (1,000/8) visitors each. Therefore, it is best to estimate the amount of traffic you would need beforehand and calibrate the number of variations (or number of elements) accordingly. You could use a significance calculator for this task. Each test is accompanied by an acceptance of a certain probability of error in the test results. You should also keep in mind that increasing the number of variations increases the chances of false positives. For instance, let’s assume the probability of error to be 5% for each variant. Let the number of combinations in the test be 20. The probability of a false positive in at least one combination is 64% [= 100* (1 – (95/100)^20)]. This problem is also nicely illustrated in the XKCD comic Significant. Your A/B testing should account for these multiple comparison problems. We at VWO now employ the Sidak Correction to deal with this problem. You can now have confidence that the probability of having even one false positive, across all the combinations, is less than 5%, considering that all combinations are equal. With the results of an MVT, you first check which variant has achieved the highest (and significant) uplift and gather insights. But what if you received inconclusive or negative results? Regardless of whether improved versions of your website are found or not, every test ends up being a good learning opportunity. For failed multivariate tests, you can find out hidden winners by applying post-test segmentation. By Source: Separate your organic traffic from your paid traffic, that is, the traffic that comes from social sites and referrals. By Behavior: New versus Returning visitors; visitors who are from the US versus visitors from Europe. Different visitors have different purposes for coming to your website. It is important that you realize what they want and make sure they get it. By Outcome: Segregate people on the basis of the products they purchase, the size of purchase, or who filled a form versus who made a purchase. If you have an inconclusive MVT result, you can still find a hidden winner or visitor behavior analysis to derive meaningful insights. Do you run multivariate tests? I’d be curious to hear from you about your ideas and experience on multivariate testing. Please leave a comment.